San Diego (Feb. 11, 2014) – Mexican boxing superstar Canelo Alvarez and his vicious, hard-hitting foe, Alfredo “El Perro” Angulo have been busy at their training camps in San Diego and Oakland, Calif., respectively as they ready themselves for their upcoming showdown on Saturday, March 8 live on SHOWTIME PPV® from the MGM Grand Garden Arena in Las Vegas. “This fight ahead is a hard one. There will be a lot of punches thrown. Two different styles will clash in the ring and there will be a lot of action. It will be a war that we’re all going to enjoy. “Angulo is a strong fighter. He is a fighter who hits hard and can last a long time in the ring. He is a fighter that always makes his fights tough and you have to work hard to beat him. That’s what will happen on March 8 and that’s what we’ll hope to see. “We decided to train in San Diego because it is a beautiful city with great climate all year round. The weather was a deciding factor. [On coming off of a loss against Floyd Mayweather] “I consider myself a person with a strong mindset and that’s how I moved on from the loss against Mayweather. I always train to win, like everybody else and unfortunately last September was not the case. “Camp is going great. I have never felt better in the gym. “My hands have definitely been doing the talking. My sparring partners will tell you that. “My team is working so hard as we do every camp. “If [my trainer] Virgil [Hunter] is happy, then I am happy because I know that I am physically on point. 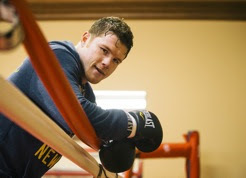 “TOE TO TOE: Canelo vs. Angulo,” a 12-round super welterweight fight taking place Saturday, March 8 at the MGM Grand Garden Arena in Las Vegas, is promoted by Golden Boy Promotions and Canelo Promotions and sponsored by Corona and AT&T. Carlos Molina vs. Jermall Charlo is presented by Golden Boy Promotions in association with Warriors Boxing. This event will be produced and distributed live by SHOWTIME PPV® beginning at 9:00 p.m. ET/6:00 p.m. PT. The event can be heard in Spanish using secondary audio programming (SAP).